Look what we brought home! After having a minor surgical procedure (and feeling blue), Laura and I dropped by one of our favorite bakeries - New Boston Bakery. Way to cheer me up, Laura! She went inside to choose a few of their freshly baked goodies. Then we raced home. Since I hadn't seen what she'd chosen, it was like Christmas morning opening the presents. Ooh, she chose good! 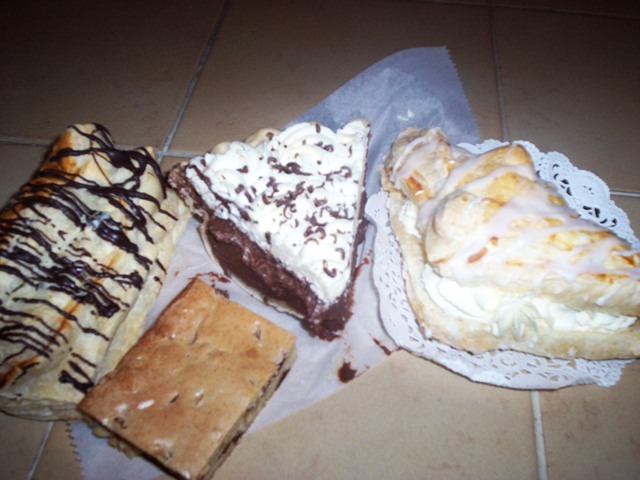 There was a slice of chocolate cream pie, a chocolate tunnel, a blondie, and an apple cream turnover. THE VERDICT: Amazing! The pastries here are always unique and delicious and these were no different. The pie had a tasty cocoa under-taste. 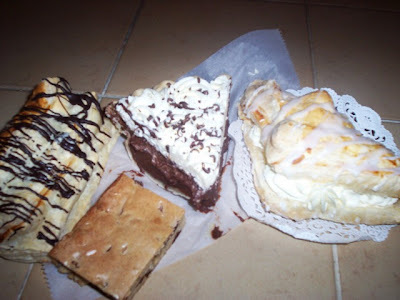 Both the turnover and tunnel had great flaky pastry shells, and the brownie had a wonderful flavor of walnuts. Everything was so good, I almost forgot I'd just had surgery ... almost. Visit our new friends at TheIngredientFinder.com, and as always, check out MenuJoy.com for great area restaurant menus.